Kathleen McArthur (1915-2000) was a self-taught artist who specialised in painting Queensland wildflowers. She was also a writer and conservationist who lived in Caloundra for over 50 years. She began her painting in part to help her identify the wildflowers she noticed around her but couldn’t name. 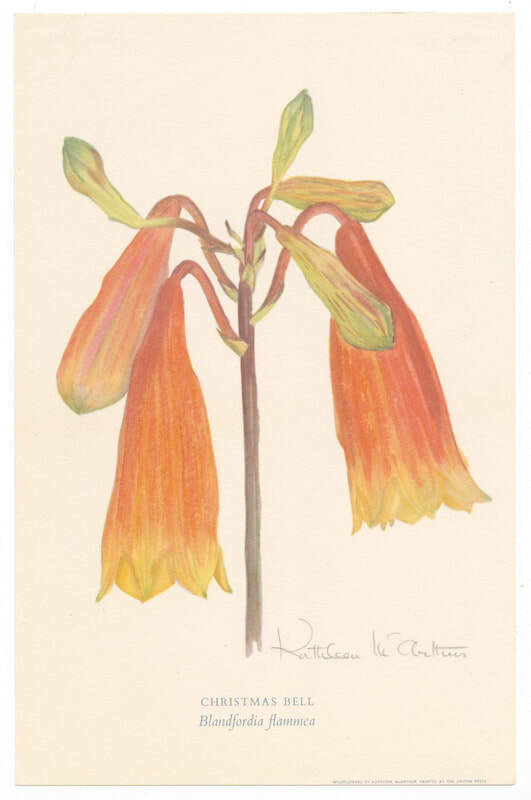 Kathleen’s desire to educate Queenslanders about their own native flowers led to her publishing the first book focussed entirely on Queensland wildflowers in 1959. She continued on to publish many books including Living on the Coast, The Bush in Bloom, Bread and Dripping and Pumicestone Passage. A shared love of the subtle beauties of Queensland’s often overlooked wildflowers led to Kathleen McArthur, Judith Wright and their families embarking on a ‘wildflowering’ expedition across the coast in 1953. Climbing to the top of Mt Tinbeerwah they looked north across the untouched plains and coastline stretching north to Double Island Point and Wide Bay and declared ‘this would make a great national park’. Their concerns about the limited knowledge of most Australian children regarding our rich natural heritage led to them forming the Wildlife Preservation Society of Queensland (WPSQ) in 1962 along with naturalist David Fleay and publisher Brian Clouston. Judith Wright served as their first President, and Kathleen McArthur was Vice-President before refocussing her efforts back on the coast to form a Caloundra Branch for the WPSQ in 1963. In the late 1960s Kathleen and Judith lead one of Australia’s first major conservation battles, creating nation-wide public awareness of the existence of and special nature of the Cooloola region. Working alongside many others, such as Arthur Harrold (of the Noosa Parks Association), they embarked on a 22-year campaign which finally resulted in the gazettal of Cooloola National Park in 1975. A highlight of their Cooloola campaigning was the distribution of 100,000 protest cards right across Australia, with an estimated 15,000 of them being sent to Queensland’s then Premier Joh Bjelke-Petersen. This success was even more remarkable when considering the pro-development, conservative politics of Queensland throughout that time. Kathleen also established a native plant nursery at her home ‘Midyim’ in Caloundra and the Sunshine Coast wildflower show in 1967. This was the foundation the Sunshine Coast Wildflower Festival which is still held annually today. In 2002 Kathleen was voted the Sunshine Coast’s citizen of the century in recognition of her 40+ year history of passionate campaigning for the environment. In 2003 the Currimundi Lake Conservation Park (one that she had lobbied to have established) was renamed in her honour and is now Kathleen McArthur Reserve.